Eclipse Awning Life Under the Awning Blog Blog Reduce Energy Cost, Add Value! As a society we’ve seen a shift to become “greener” with energy efficiency at the top of the lists. Go green by reducing energy & cost all while adding value to your home with retractable awnings. According to the Professional Awning Manufactures Association, awnings can reduce air conditioning costs by as much as 25%. 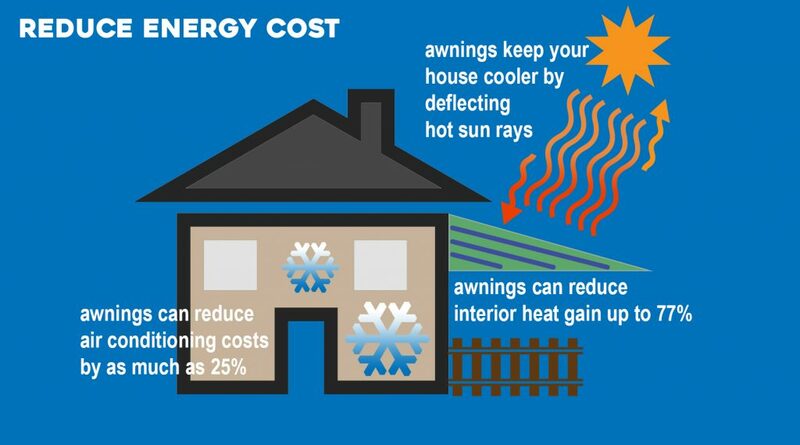 Here’s how it works, it keeps your house cooler by deflecting hot sun rays, thus saving you money on cooling your home. You can save big on energy bills by spending less time indoors utilizing lights and air conditioning. By filtering the amount of incoming light, any awning can help reduce the fading of furniture, carpeting, and draperies. Based on a study completed by the American Society of Heating and Air Conditioning, exterior mounted shading systems can reduce interior heat gain by up to 77% and also reduce heat and water damage to deck, patio, pool deck, and balcony surfaces. Retractable awnings not only have the potential to reduce your energy consumption and cost, but they also add comfort and style by extending your living space outdoors to enjoy with family and friends. A retractable awning provides an easily accessible shaded outdoor living space in which anyone can relax. Almost instantly increasing your home’s value as it virtually creates additional space that didn’t previously exist. Long gone are the days of increasing property value through expensive and lengthy home renovations. Think smart and expand your outdoor space all while adding curb appeal.